Buy this if- you like illuminated skin, and softness. Don’t buy this if -you have naturally oily skin. I bought this product to replace my Clarins Beauty Flash Balm which I found to be too strong for my skin. So I started using this product mixed in with my foundation to give it some more fluidity and to give my skin a bit of pep in the morning. So whats in it well, apricot kernel, aloe vera and ‘immediate face firming active INSTANTIGHT’ Ah instantight, what the heck is that and what does it do, well apparently it lifts and tightens your skin, so thats gotta be good right? Ive been using it for about a month now and I can’t say ive seen any lifting or tightening, but to be fair Im 26 and I don’t smoke and I use SPF so I dont have much lifting or tightening to do on my face. But it does make my skin feel really fresh. When I use it its with my foundation and it creates a lovely dewy look. It really illuminates my skin, and makes you look a lot fresher and sometimes more awake in the morning. Coupled with the Trick or Treatment Concealer it really provides a lovely base very flawless and young. I use this mixed with my foundation which currently is Bourjois 10 hour sleep effect all over, then dab a little of Soap and Glory Trick or Treatment concealer under the eyes and in the corners of my eye. 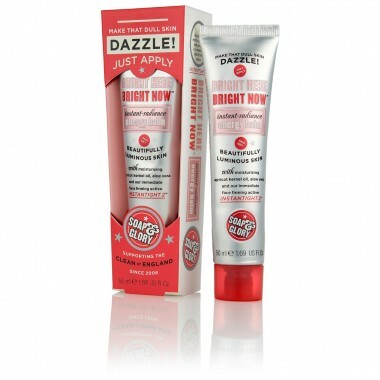 Finish it off with Solar Power bronzing duo and you get a really lovely dewy fresh look. I’ve used a lot of different product combos but this one is currently my favourite, I also think it knocks a few years off because its nice and light on your skin and doesnt make it look like your make up is caked on. Plus strategic use of trick or treatment gives a nice glowy look to your eyes. Love it, for creating a flawless young and healthy looking base.